I live in Cardiff, on the Whitchurch Exchange, which is one of the g.fast trial locations. Openreach appear to have been busy bees in the last few months and my cabinet (cab 2) has sprouted a g.fast extension pod about 2 months ago. However g.fast is nowhere to be seen and can't be ordered. I've tried the Openreach Twitter monkeys who were useless, and I've asked an engineer I spotted outside as well, but there seems to be nothing on when g.fast can be ordered? Secondly, the Openreach engineer popped open the manhole outside my house and said "It's fully fibre set up for FTTP". The BT Broadband Availability Checked does list FTTP On Demand as an available product at 1000/220, but again, I can't seem to get anywhere with ordering. I did some further digging on the Openreach fibre checker, and properties a few doors down can get g.fast, so it looks like the pods are active. I called my ISP, Zen, and they spoke to their provisioning team who said that maybe my house and immediate neighbours are on a different circuit within the cab that isn't enabled yet? Sounded rubbish to me, is it more likely to be range of g.fast? (I'm between 2-300m depending how the cables run). FTTP on Demand is not the same as a native FTTP deployment. All of this is perhaps best explained over here (see below), although if the fibre passes right outside your house then it’s possible the FTTPoD install cost may be much lower. But right now nobody can order it. Meanwhile it's not uncommon for Openreach to install a new G.fast pod and then leave people waiting nearly a year before the service actually goes live, which I've seen happen in quite a few areas. In terms of native FTTP availability, you might be better off going directly to an ISP like Zen Internet, iDNet, Freeola or Cerberus Networks and checking via their checkers to see whether or not you can order it yet. Sounded rubbish to me, is it more likely to be range of g.fast? (I'm between 2-300m depending how the cables run). I think you're probably further than 300m away from your cabinet - I am approx. 253m from my cabinet (according to a GEA test) and I get near maximum 79997 downstream sync rate so based on your current sync rate I think your line length must exceed the current G.fast range. Re: FTTP, it could be as you say, nobody can order it so I can't get anywhere either. My ISP is Zen, and they're showing us only available for FTTC. Actually that made me look, and I'm actually below my handback threshold. Zen are currently running line tests and it looks like there'll be an Openreach engineer visit on the horizon. As the crow flies I am 203m from my cabinet. If you follow the route of the access hatchways I am 280m. I'll ask Zen to run a GEA test tomorrow as well once the 24hrs of line speed testing is complete. I'm a bit surprised g.fast is coming in this short ranged to be honest. True it is a bad investment I think you will find it is BT's way to combat Virgin Media faster speeds since the G.fast is available in my area which is VM enabled. Sadly only ones who can benefit from G.fast are on VM the neighbours I have been talking to use VM they are all closer to the cabinet than me. The one new neighbour moved in 6 months ago that was going to sign up for G.fast actually went VM route apparently. Alas, Cardiff is a black hole for VM. Openreach have no competition so can just mess around constantly like this! 24hrs of line testing complete with new filters etc. and connection speed dropped to 56.3Mbps. Oops. Below threshold for handback and the GEA line test also failed returning no results. Engineer visit has been requested, just awaiting appointment. I'll then ask them what on earth is going on about the g.fast setup round here! We have received the engineers notes who resolved an external between the cabinet and premises. Unfortunately a "broadband boost engineer" is not something that we are able to offer. Upon rechecking the line estimates your connection would also go off a "Range B" estimate. In previous years Openreach use to install there own modems and therefore we would go off "Range A" estimates. According to a Range A estimate the minimum is 60Mbps down however the handback (Fault threshold rate) is 52Mbps on the downstream. Should the line fall below 52Mbps it would then be classed as a fault. We will monitor the connection to ensure it remains stable and contact you again. To me that reads Zen have decided I'm now an impacted line and will use the 52mbps downstream threshold. So I'm not exactly happy about that because the reason given sounds...rubbish. 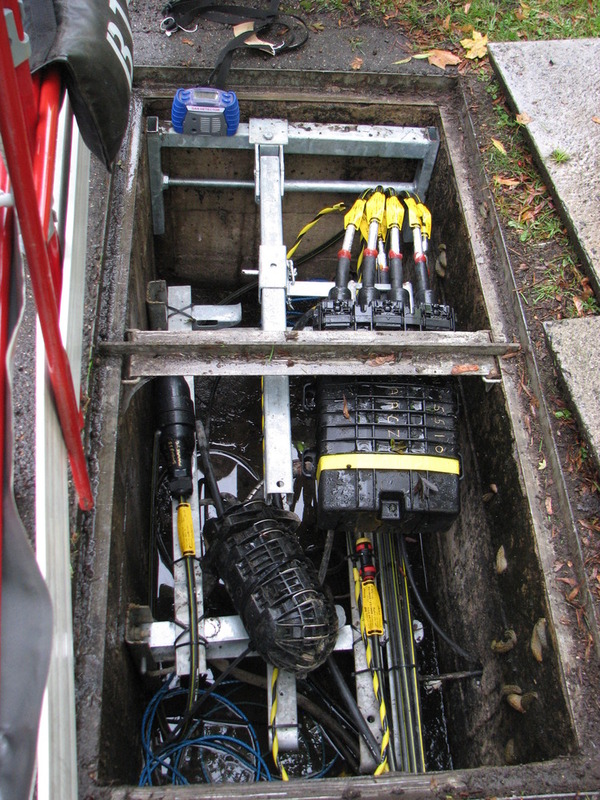 However, whilst the engineer was here we had a chat about FTTP and he popped open the manhole outside. There's is 100% a brand new fibre run out there, with 12 ports sitting waiting to be connected. Apparently the plan is for activation in Jan/Feb 2019 on the Whitchurch exchange, it was going to be earlier but something happened in Newport (it's always Newport...) that pulled a lot of engineers for a while. As you say, ngnfzu, they're completing work in the exchange and then it'll be ready. So, I'm just going to wait for the FTTP to go live, hopefully in Jan/Feb. That way I'll get full line speed rather than the variability g.fast offers. Yes G.fast is a flawed product it is pushing the bounderies and the slightest varience can be the difference between good speed and crap speeds. The money wasted on G.fast would have been a better investment adding it to the FTTP route. So as an update to this, FTTP has gone live over the weekend so the Whitchurch exchange upgrade must be finished. I'll be ordering via Zen first thing tomorrow morning. I hope it still comes with an Openreach modem so I can ditch the Zen-provided Fritz box and hook straight in to my UniFi router. A friends sister has FTTP and has an OR router, so it's highly likely. Well, FTTP is live and kicking. Also had zero issues connecting my UniFi USG 4 Pro gateway. Simply set it to PPPoE and popped in my old username and password. On the battery backup question, the last I heard they were still consulting with ISPs on how to handle it so at present if you order an OR FTTP line then you should still get a BBU. Bit of a mixed bag really, during 2018 we saw a large number of FTTP installs where they had stopped fitted the BBU, however, since the start of 2019, BBU seem to getting fitted again. There does not appear to be any push back from ISPs to force Openreach hands either way and in recent industry get togethers, the BBU issue is not being brought up as a problem.